Kevin was raised in Lafayette and has worked locally in several different areas of the construction industry, including demolition, drywall, and framing. 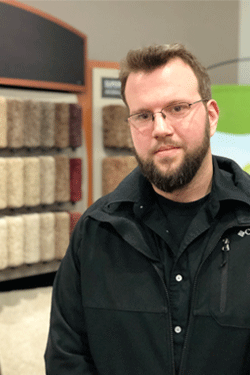 He joined the flooring and blinds business about three years ago. Moreover, Kevin has an eye for detail, and is highly customer focused, believing that a job isn't done until the customer is happy. He enjoys music, books, movies, and bread, and loves animals.